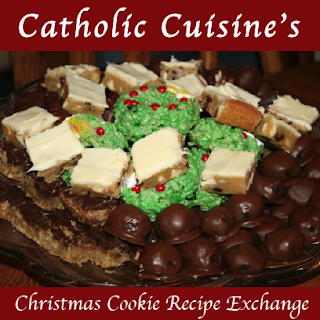 With Christmas just days away, I thought it would be fun to host another link-up here at Catholic Cuisine, so we can all exchange Christmas Cookie Recipes. To participate, just post the recipe(s) on your blog, add the button above and link back to this post (though not required for participation), and then add the link to your recipe below. This link-up will be open until January 1st. I pray that you are all having a Blessed and Fruitful 4th week of Advent as we prepare to celebrate the Birth of Our Lord! Thanks for hosting a link-up. I couldn't figure out how to grab the button, sorry I am not very "techy". Merry Christmas! This was a wonderful idea! Merry Christmas to all! Oh, what fun! I didn't think I was going to make it, but I ended up with some quiet down time today thanks to kids playing outside in the in snow! Merry Christmas, Jessica! Fun! I linked up to my favorite recipe that I posted last year. I'll re-post it later on this week. The 3 Tier Bars are sooo good! I can't wait to try some of these recipes. Merry Christmas! Love this blog! Although I missed posting for Christmas, wanted to share an easy cookie recipe that would also be appropriate for New Year's celebrations. It's easy to make, too! Thanks for hosting, Jessica. Merry Christmas!